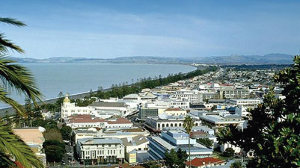 Napier is the leader of the value growth pack in QV's latest House Price Index. Investors on the search for capital gains should look to the regions as new QV data reveals many are still experiencing strong value growth. The heady days of double digit property price growth might be over for Auckland, but the latest instalment of QV’s House Price Index shows they’re not over in certain regional centres. In Napier, property values increased by 16.5% year on year and by 3.1% over the past three months, leaving the city’s average value at $488,236 in February. Hastings values also shot up. They rose by 13.8% year-on-year and by 2.0% over the past three months, leaving the average value at $451,686 in February. QV Napier senior consultant Philippa Pearse says the Hawkes Bay market remains buoyant with strong value growth continuing and investors still active. Both first home buyers and investors are active in the lower valued areas of Napier and Hastings like where properties under $400,000 are available, she says. “Central Hawkes Bay has seen value growth of more than 20.0% over the past year. While Central Hawkes Bay* might be leading the value growth pack, Nelson (up 10.5% to $567,767), Invercargill (up 10.2% to $259,919), Dunedin (up 9.3% to $392,921) and Whangarei (up 9.1% to $510,409) are all seeing very healthy year-on-year growth. Meanwhile, QV’s February data shows that nationwide property values increased by 6.5% over the past year and by 1.2% over the past three months, leaving the average national value at $672,645. Once adjusted for inflation the nationwide annual increase drops slightly to 4.9%, but this is up on the 4.7% recorded in January. QV national spokesperson Andrea Rush says that values continue to rise faster in Wellington (up by 8.6% to $640,737), Dunedin and many regional centres than in Auckland. Once adjusted for inflation, the Auckland region saw its value growth drop by 0.6% year-on-year and inch up by just 0.8% over the past three months, which left the region’s average value at $1,053,948 and indicates the market remains sluggish. In contrast, Rush says the Hamilton and Tauranga markets have picked up in February after a sluggish start to the year while the Hawkes Bay continues to see some of the strongest value growth in the North Island. While Christchurch saw its values drop over the past year, many regional areas of the South Island - including Nelson and Central Otago - continue to see values rise, she says. “Low interest rates and the easing in the LVR restrictions has seen many more first home buyers active in areas where they can still afford to enter the market. *Read our recent regional review of the Hawkes Bay here.